A company, which is setting up a new bike-sharing scheme in Dublin, is going ahead with its service despite warnings from Dublin City Council that it could seize the bicycles. Bleeperbike is rolling out the first stationless bike-sharing scheme in Ireland. The service is different to traditional station-based services, such as Dublin Bikes, as instead of going to a station to get a bike, users use an app on their phone to find the nearest bicycle, which all carry GPS beacons to show their location. When finished using the bike the user simply locks it and the next user finds it using the GPS locator. Stationless bike-share schemes started in China and in some cases proved controversial because of users leaving bicycles abandoned or badly parked around train stations or apartment blocks, causing a nuisance to others. But Bleeperbike says it will be encouraging users to park legally and responsibly through a points-based system and will also employ staff to check that bikes are parked probably and move those that are not. RTÉ News understands there are several other companies looking at setting up stationless bike-sharing schemes in Dublin this year but Bleeperbike is the first to go live. The Dublin City Transport Committee discussed new bike-sharing schemes at a meeting last month and decided "that by-laws should be prepared and engagement with the market should take place with a view to running a pilot scheme in Dublin". 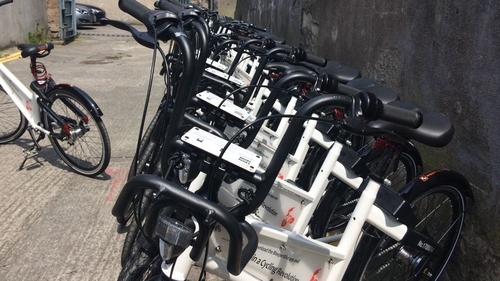 In a statement issued on Friday the council said the launch by Bleeperbike was "premature... and may secure an unfair advantage over other potential operators who are prepared to work closely with Dublin City Council". The council wrote to Bleeperbike to request that it desist from launching at this time and has warned that it is "empowered to remove them from the public domain".